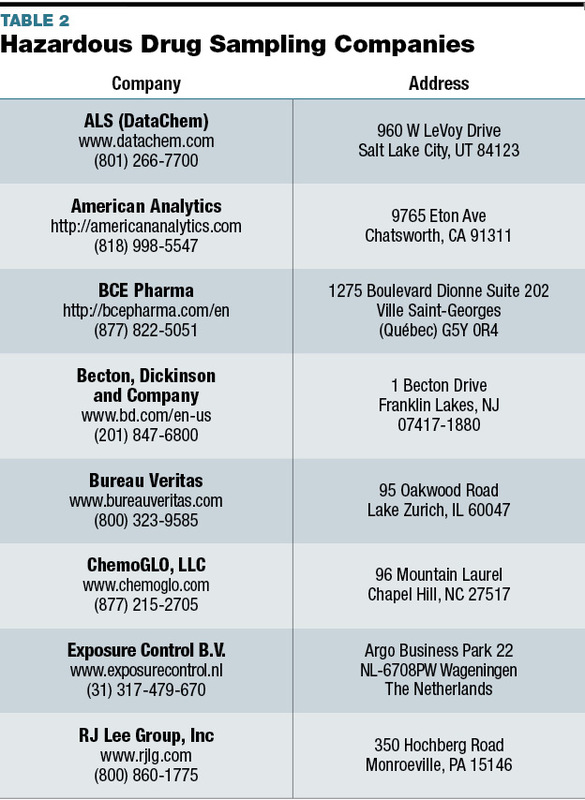 To read Part 1 of this series, Elements of a USP <800> Compliance Cleaning Program, go to pppmag.com/MassoomiCleaning. 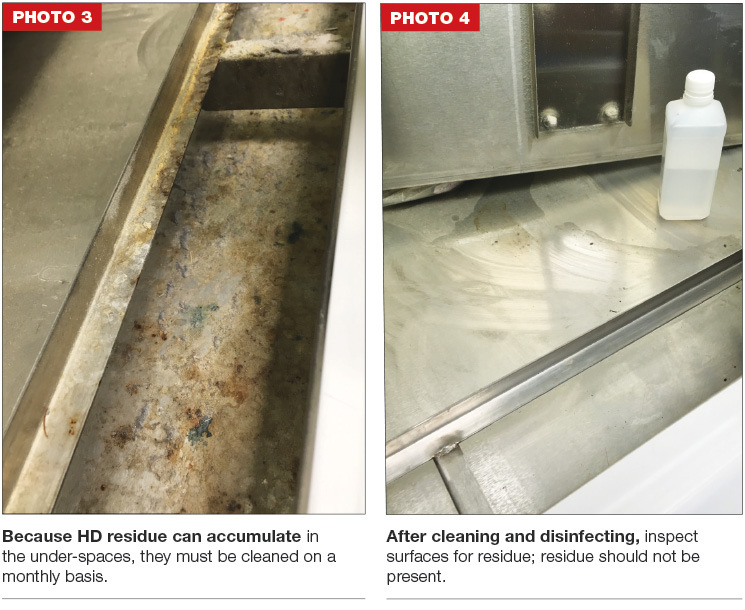 An effective cleaning program supports safe hazardous drug (HD) handling, eliminates transference of HD residue throughout the facility, and helps ensure staff and patient safety. A robust cleaning program should include clearly delineated standard operating procedures (SOPs), staff training, and follow-up monitoring to ensure best practices are maintained over time. The following tips will help ensure an effective cleaning program. 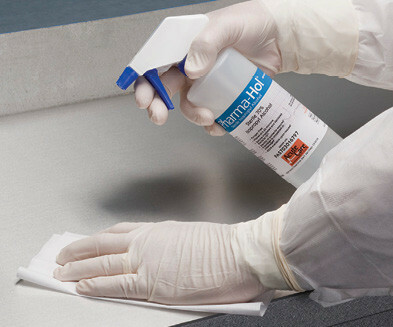 The four USP <800> cleaning steps must be employed in all locations where HDs are handled. Detailed information on the four steps is included in Part 1 of this series, available at: pppmag.com/MassoomiCleaning. Cleaning is considered a hazardous process that requires formal staff education, demonstrated competency, and proper documentation. Sites must clearly define what PPE is required when handling cleaning solutions, as cleaning solutions can be caustic to skin and may elicit respiratory reactions. Do not assume that HD-rated PPE is suitable for all cleaning solutions; all PPE must be vetted to ensure it is resistant to the cleaning solutions used. To begin, review the accompanying literature for the PPE and consider requiring the use of two pairs of HD gloves rated to ASTM D6978 as well as impermeable disposable gowns rated to ASTM F739 for cleaning activities. Because there is a potential for splashes to occur during the cleaning process, sites should strongly consider the use of tight-fitting eye protection or face shields. 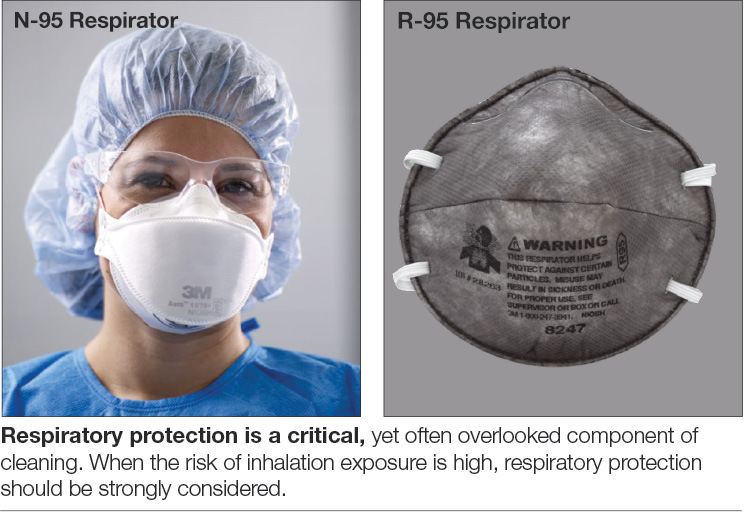 Some solutions may require the addition of respiratory protection beyond a paper mask. In this case, consider employing a fitted N-95 mask. Furthermore, when handling solutions with nauseating odors, it is possible to utilize an R-95 mask that incorporates carbon or charcoal to filter out nuisance smells when cleaning areas exposed to drugs such as carmustine, cyclophosphamide, cisplatin, etoposide, and 5-fluorouricil.1 Note that this is not a complete list of drugs that have the potential to vaporize at room temperature, but represents a group of drugs that have been tested. Additional information about respirators is available in the July 2018 PP&P article, Choosing Proper Hazardous Drug PPE for USP <800>: Part 2, at pppmag.com/MassoomiRespirator. Click here to view a larger version of these photos. A report from the World Health Organization (WHO) identifies hospital cleaning solutions as a potential cause of respiratory (Chronic Obstructive Pulmonary Disease [COPD]) and reproductive disorders, eye and skin irritation, central nervous system impairment, cancers, and other human health effects.2,3 Under the US Occupational Safety and Health Administration’s (OSHA) Hazard Communication Standard (HCS) (29 CFR 1910.1200(g)), chemical manufacturers, distributors, or importers must provide safety data sheets (SDSs) (formerly known as material safety data sheets or MSDS) to communicate the dangers of hazardous chemical products. SDSs include the properties of each chemical; its physical, health, and environmental health hazards; required protective measures to employ when using the solution; and safety precautions for handling, storing, and transporting the chemical. To ensure staff is properly educated and protected when using cleaning solutions, organizations must share SDSs with all staff using these chemicals; this is particularly important for those staff members with active airway diseases (eg, asthma, COPD). Documentation that staff has received this information, and that an assessment of risk to exposure has occurred, are required. Cleaning solutions should be applied with equipment specifically designed for cleaning cleanrooms; avoid over-the-counter or commercially available equipment that may react or melt from repeated exposure. The cleaning equipment itself should be placed on a routine cleaning schedule, and be sure to determine when equipment must be replaced due to wear and tear and risk of contamination. 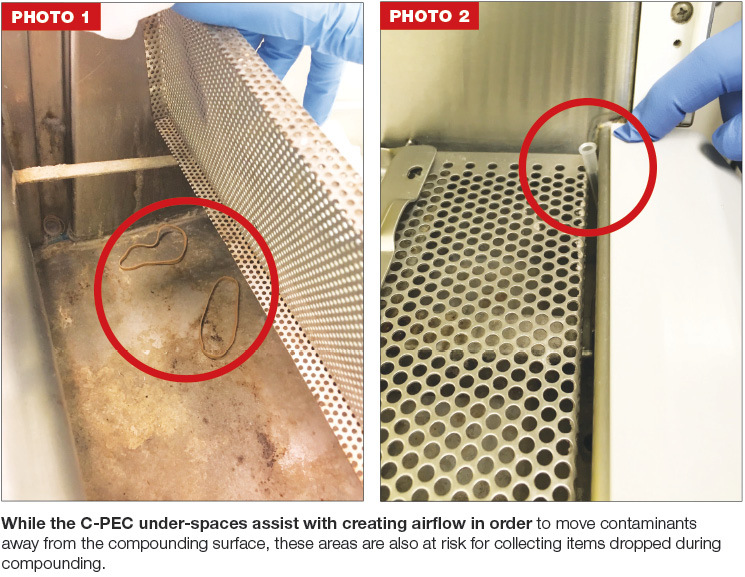 Cleaning solutions should be poured onto sterile, disposable, low-linting wipes, rather than sprayed, due to the risk of aerosolization of the solution(s) as well as the potential to aerosolize moistened HD residue. All cleaning materials and PPE must be considered contaminated and disposed of according to state and facility policies for hazardous materials. Several published articles have starkly demonstrated that measurable HD residue exists on the outside of vials, the accompanying package inserts, and the outer shipping boxes of vials received from manufacturers.4 USP <800> states that sites can reduce contamination by wiping down vials prior to placing them on any surfaces (eg, preparation tables, staging bins, primary engineering controls). Be sure that the cleaning solutions used for decontaminating drug vials do not impact the readability of the label. In the event of a spill, deactivation, decontamination, and cleaning should occur immediately; if the spill occurs on a compounding surface, disinfection must also occur. To minimize HD exposure for maintenance and certifying personnel, surfaces should be cleaned prior to any servicing by personnel outside of the department. C-PECs are designed to circulate ISO 5-classified air in a unidirectional pattern. 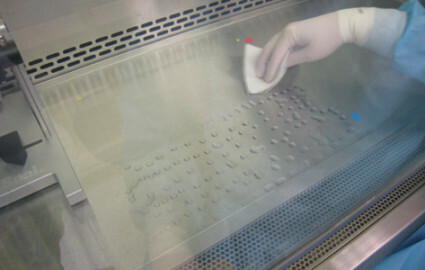 To accomplish this process, their design may include areas under the compounding work surface trays. These under-spaces assist with moving air through vents located near the compounding surface to move contaminants away from the compounding surface. However, these areas may accumulate HD residue and items dropped during compounding (eg, vial caps, syringe packaging, pens, alcohol swabs). PHOTOS 1-4 demonstrate items and HD residue contaminating the area under the compounding work surface trays. USP <800> clearly states that the under-spaces must be cleaned using the four-step process on a monthly basis to reduce contamination build-up. Click here to view a larger version of PHOTOS 1 and 2. Click here to view a larger version of PHOTOS 3 and 4. It should be noted that accessing the under-space can be challenging, so staff may require assistance lifting and holding the upper work surface in place during cleaning. 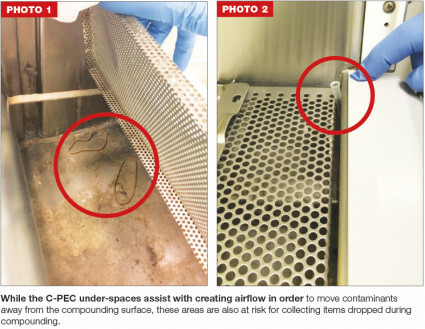 In addition, cleaning this surface disrupts the C-PEC’s protected airflow, and should be classified as a hazardous process requiring additional PPE and specialized training. Sites are encouraged to check the manufacturer’s maintenance information on the proper process for accessing the C-PEC under-spaces. 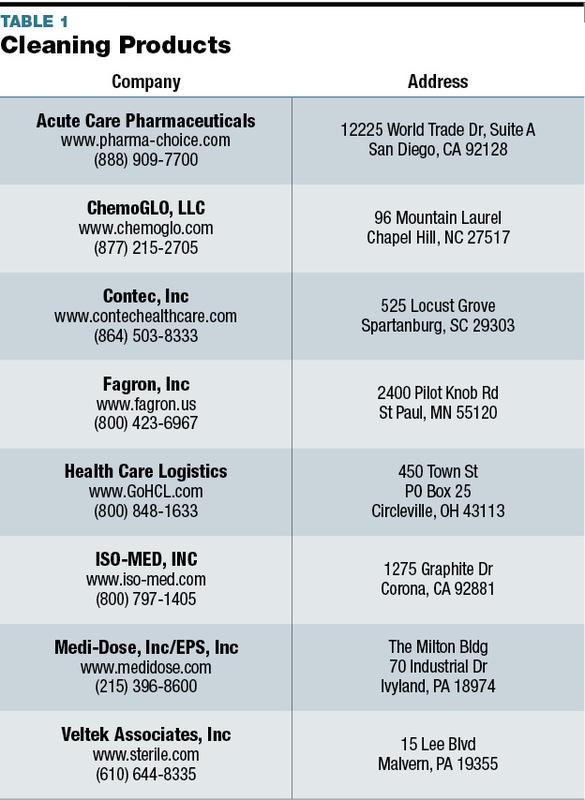 See TABLE 1 for a list of companies that supply cleaning products. Click here to view a larger version of TABLE 1. USP <800> recommends routinely conducting surface sampling for HD residue, including an initial wipe analysis to establish a baseline. To establish a true baseline, wipe sampling ideally should be conducted prior to beginning the process of redesigning and reconfiguring work spaces to meet USP <800> standards. A number of HD wipe sampling test kits are available, including traditional wipe analysis kits that quantify defined HD residues, as well as a newly introduced quick test system that detects the presence of defined residues without quantifying the amount present. 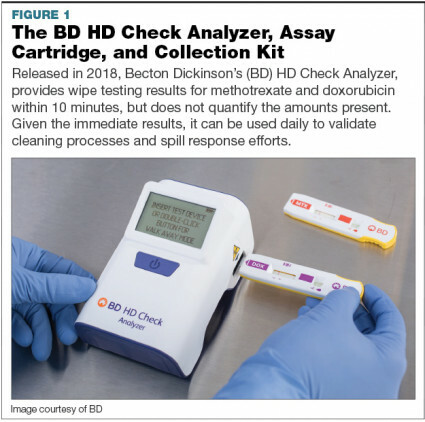 Note that these new quick test systems identify only a few HDs; as such, non-detectable results from a specific analysis do not guarantee complete absence of HD residue. Result assessment from wipe sampling is complicated by the fact that there are currently no standards for acceptable limits of residues; however, the goal should be a zero tolerance of measurable residue(s). The HD Check Analyzer checks for the presence of the drug without quantifying the amounts present (see FIGURE 1). Nonetheless, the presence of residue results in the same response to a quantified sample: recleaning and reassessment to baseline. 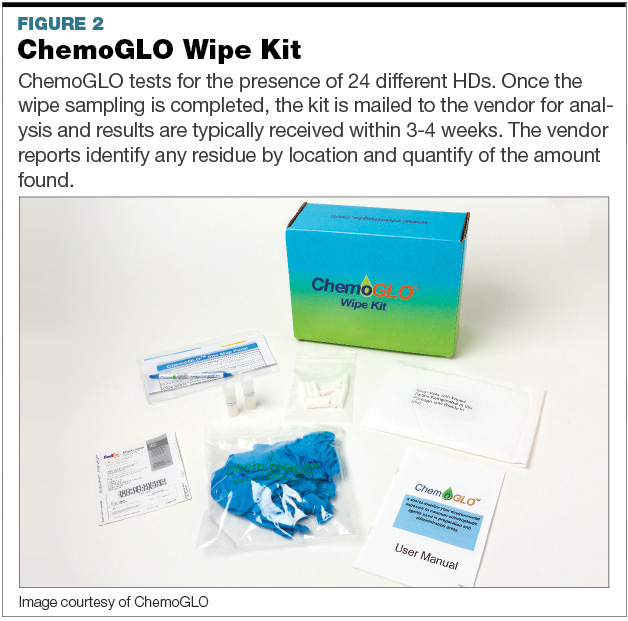 A variety of vendors provide HD wipe sampling test kits (see FIGURE 2 and TABLE 1). These traditional tests cover a wider variety of HD compounds. Click here to view a larger version of FIGURE 1. Click here to view a larger version of FIGURE 2. Conducting wipe analysis to identify HD residue helps sites validate their comprehensive HD handling practices. Without this validation, facilities may blindly assume that their cleaning programs are adequate and that they are immune to the widely established pattern of environmental contamination. Regular wipe studies identify the site’s active risk, allowing the facility to either improve practices or praise staff for following SOPs. Thereafter, a well-defined, systematic program for routine sampling assists in monitoring staff’s diligence at following SOPs. A variety of integrated cleaning systems are commercially available in the US. These systems are intended to reduce the complexity and increase the ease of HD cleaning. Some systems employ the use of pre-saturated cleaning solution wipes for each step of the cleaning process. Note that some systems may not address each of the four steps, thus requiring sites to supplement with an additional product. Conversely, some vendors have enhanced their testing to validate that a single product can be used for multiple steps of the four-step cleaning process. The manufacturer of any commercially available cleaning system must provide validation that demonstrates the product’s desired result. In addition, organizations should collaborate with their infection control, employee health, safety, and environmental services departments in selecting products, training staff, and monitoring the use of these products. Click here to view a larger version of TABLE 2. Kiffmeyer TK, et al. Pharm J. 2002;268:331-337. European Lung Foundation. Nurses’ Regular Use of Disinfectants Is Associated with Developing COPD. ScienceDaily. www.sciencedaily.com/releases/2017/09/170910232514.htm. Accessed January 24, 2019. World Health Organization. Chronic Respiratory Diseases: Causes of COPD. www.who.int/respiratory/copd/causes/en/. Accessed January 24, 2019. Power LA, et al. Hosp Pharm. 2014;49(4):355-362. 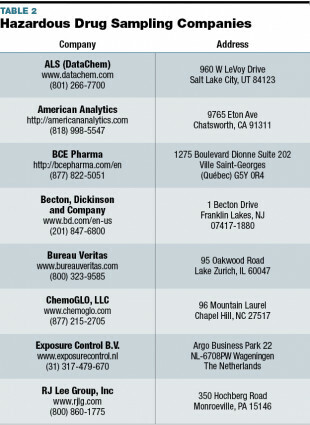 US FDA CDER Office of Compliance. Compounding and Related Documents, Revision 1: Insanitary Conditions at Compounding Facilities Guidance for Industry. 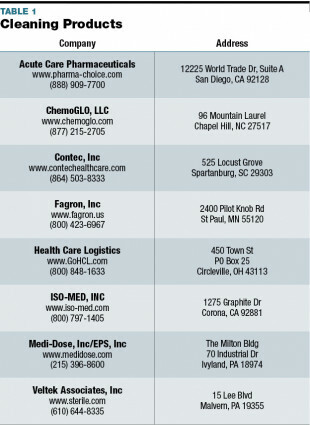 www.fda.gov/downloads/drugs/guidancecomplianceregulatoryinformation/guidances/ucm514666.pdf. Accessed November 27, 2018. Bacillus of Calmette and Guerin (BCG) [package insert]. Whitehouse Station, NJ: Merck & Co, Inc; 2018. Hazardous Drug Handling Supplement to Pharm Purch Prod. July 2018; S14, S16. Crul M, et al. J Oncol Pharm Pract. 2018;24(7):483-489. Fred Massoomi, RPh, PharmD, FASHP, is a senior director of hospital and health-system pharmacy for Visante, Inc. He received his doctorate from the University of Kansas School of Pharmacy. Fred is a member of PP&P’s Editorial Board.